I can't be the first person to think this, but Paris seems to me to be more about the idea of a place than the reality itself. Whether it is the preconceived notions of a kid from the country about the impositions of the capital, the hopes of illegal immigrants that have climbed up from Africa to make the most of their hard-won French or just the open-faced dreams of honeymooners who cast their love on the banks of the Seine. Somehow all of these thoughts, floating through winter's silver light, make Paris seem as if it is not entirely solid, as if you could walk up to the Louvre and push your finger into it as if it were a cream pie. It had been four years since I had been there and even that was a mere jet-lagged stumble on my way back from a story that Remi and I had done in Bali. At the time, I was still cloaked in the resentments and disappointments acquired during my four years of living on the outskirts (because aren't I always?) in the suburb of Vanves. However, I had nothing but hope in my heart for the visit last week. Remi was exposing three of his abstract pieces at the Salon de la Société des Artistes Indépendants, the very one that had been formed by the "rejects" of the Beaux Arts in 1884. Four years later, Vincent Van Gogh, another bad boy with a love of Arles, debuted his paintings from Provence there. Last Sunday, we arrived under the glass domes of the Grand Palais with two thousand other artists, lined up to drop off their works. Admittedly, my inner fashionista was fascinated to be in the home of Karl Lagerfeld's brilliant Chanel shows, but the look of diffused pride on my loved one's face firmly brought me back to the present. The rest of our trip flew by in a flash of footsteps but there are quite a few lasting impressions. Leaving behind the snobbism of Paris Photo to be the last couple to cross the Jardin des Tuileries in the dark before the gate was closed for the night. Showing up smiling at the office of an important magazine. 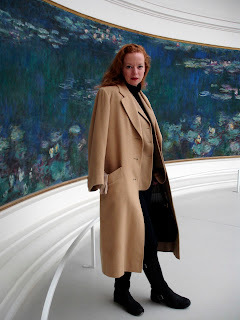 Unveiling to Remi the Orangerie whose two rooms of Monet's Nympheas very well may be some of my favorites on Earth. And most importantly, the Opening Night of the Salon, where we served champagne in plastic cups to a loyal group of friends and family gathered in front of Remi's photography. Earlier that day, I splurged and got my hair trimmed with a blow out by the charming owner of an old-school salon in a bourgeois neighborhood. As I sat in a café afterwards, waiting for Remi, I studied the passer-by but also my reflection in the window. How much has changed since my arrival in Paris nine years ago. I was terrified, had lost my much-treasured ability to express myself in face of a new language and felt the heavy stares of disapproval over everything from my rock and roll leopard coats to the way I held my fork. I had left behind my career and family, buoyed only by being wildly in love. Now I can communicate with anyone with nary a "Pardon?". True, at forty-one, I am "Madame", my days of "Mademoiselle" gone for good. If I have grown up a bit, I have also grown out. I do not know what project will be next. But at that moment, inspired by Remi's bravely surging into a new field of art, the weighty warmth of the surrounding café patrons and the impermanence of Paris, I was ready for all that lies ahead. Jean-Michel, our caviste, or wine-seller, has assured me that this year is "very good". Would he tell me if it wasn't? Well yes, good customers always get the truth around here. And though Chez Ariane, the wine bar that I have written about, has closed the street off for music and dancing--a buvette, as it is called--I am warmly ensconced in my club chair, about to lift a glass of Syrah (gasp!) to my lips. Salut! In 1909, what was apparently a pretty rough and tumble earthquake rippled across the plains above Salon de Provence, in particular doing extensive damage to the village of Vernegues. Photos from the aftershocks show moustachioed men holding heavy bowler hats over their hearts as they clambered over the remains of their houses. What remained? Only the fortified chateau grasping at the top of a hill like a raven's claw and the shell of the 13th century Saint Jacques Church. Now, I don't know where you were in the 1200s but there was obviously quite a lot going on in this church. It still has the resonance of centuries of weddings, births, deaths and a whole lot of faith within its scarred walls. And I can tell you this much, this was not a church to impress the visitors to the region, it was for the locals, by the locals. No austerity here, even though so little is left save for the graffiti of the passerby. There is an enduring sense of peace and it is catching. Ben was delighted. This massive, twisted, straight out of Sleepy Hollow almond tree has also stood the test of time, undoubtedly hundreds of years old and the church's unofficial guardian. It looks as if it could reach out and whip you if you didn't behave. And, because this is France, at the edge of this forgotten site is one lovely little salon du thé serving far, far more than tea. Oh for the truly merited joy of taking in the sun on a mid-November day under a giant platane tree with a bit of Cotes du Rhone in my glass and the most lovely foie gras salad on my plate. Yes, yes, I know. Foie gras plus salad equals an oxymoron. But look at that fantastic circle of it, alongside the sliced magret de canard, a few greens and, the star of the show, a sautéed "escalope" of the foie gras served with a pretty scrumptious chutney and sweet triangles of spice bread. Our neighbors were all equally delighted by the surprise of the day, the food, the charmingly shy "patronne" who clasped her hands in front of her chest while she spoke. The positive energy of that former village remained amongst the ruins, showing us that history is often more alive than we think. I love the messiness of Arles, the unperfectness of it. When we first visited in 2003, there were dozens of cats skittering through streets topped with flapping laundry hanging between windows, à la Sicile. At that time there were more houses that were closed up, abandoned-looking, than alive. Things have changed. And while our scruffy town doesn't resemble the pitch perfect pastels of some our neighbors, it is growing up at a rapid pace. Work teams are everywhere, pounding and shaping, revealing and polishing. The renovation of the Arena is an on-going and at times, hotly debated issue. As the last quarter of scaffolding is raised, there are plenty who prefer it as it was, as if wreathed in the smoke of a million Gauloises. But better to let it stand a few thousand years more--on that we can all agree. The "hotel particulier" or bourgeois mansion across from it was put up for auction last year. I had heard at the time that despite its beautiful facade, there was at least an equal amount to the asking price (starting at something like 700K if memory serves) needed to make it habitable. "Oui," nodded the mason that I asked as he mixed his cement. From "A à Z" he confirmed, the floorboards to the attic. It is not just time but history that has taken its toll on these old stones. Buildings in certain neighborhoods have iron bands like yawning "y"s to hold together their sides, put in place after my fellow Americans did such a shoddy job of bombing the bridge during World War II (they even destroyed Van Gogh's house to boot, something that you will never, ever hear the slightest complain about here). The roof tiles below are not far from the ancient "jambieres", translating to something not far from leggings (!) as they were originally molded on a mans thigh. As I have mentioned before, Arles is protected as a World Heritage Site and the Batiments de France is very picky about what type of materials can be used and has a final say in all of the work that is done down to the color of the shutters (however jobs done at midnight, in August, well, amazingly they seem to slide by unnoticed). The architect that bought this exceptional town house hounded the previous owner for years to sell it. Over the course of a year he has managed to reveal its great bones and presence. I passed the day that one of his assistants used a mini jack-hammer to lift off thick layers of cement encasing the ground floor exterior. He plans to turn that space into a gallery/antique store. All of this to suggest that it is wonderfully positive to live in an environment that is perennially changing. There is movement here in so many ways, not only in cleaning up the past but in shaping the future as well--but of that, another time. As if on cue, even the leaves outside my front door have burst and tumbled, preparing themselves for the winter and then, a renouvellement, another type of renovation, as the French would say. It is a well-loved tradition in France but one that, until fairly recently, I didn't have much opportunity to partake of. The Sunday lunch, a gathering of family and friends, where the entire day is set aside for just being together. Arles is famously closed off, a town where the locals proudly proclaim the number of generations that they have been here, using the term "pure suche" or "pure roots", one that is vaguely Naziesque if you ask me. All of this to say that it has taken time for us to make friends, to find our way here. Ben was a godsend in that sense. It is fairly safe to say that only kindly folks like dogs or have them. So it is with Anne, who we crossed so often in our hikes in the Alpilles that we finally made it official over drinks and have remained close ever since. She is a sculptor, who, along with Jean-Pierre, her world-travelling husband, have renovated a bergerie, or sheep's hut in the most beautiful, hidden corner of the Vallée des Baux or Baux Valley. They are, quite simply, one of the more elegant couples that I have ever met and, as is often the case, one of the most gracious hosts. Champagne and home-made foie gras to welcome in the holiday season awaited us (why are we always the last to arrive no matter how hard we try not to be?). Caviar and blinis followed, then a pot au feu that had been cooked until the meat was falling off the bone. Apple crumble to finish. All of this accompanied by a wonderful Pic Saint Loup (little known in the States but one of my favorite appelations for its earthiness) and a dash of vodka to go with the caviar for the brave. Ten at the table, the conversation at times sounded like a symphony to my American ears, one too dissonant for me to add my notes to. It was a welcome effort to bundle up for the walk to the lake, a former mine that glows turquoise with its mineral deposits. I tottered along in my high heels, Burberry trench draped over my shoulders. Sunday lunch has the slightest ring of formality to it, rendering it all the more special. The group split into twos and threes, the wind rustling through the olive groves drowning out the conversations. A final tea to warm up and then we regretfully took our leave, phone numbers exchanged with new acquaintances and grateful bisous pecked on the cheeks of our friends. If you have been enjoying Lost in Arles, I have activated a subscribe option for you on the right. All you have to do is type in your email address, click on the link that is sent to you et voila! Unfortunately, those of you that were already following will have to suscribe anew--thank you for your patience and your support! How it happened I am not quite sure but that foggy caffeine-resistant mentality turned to a dark roiling anger that scared off all that came into contact with me on Saturday. And certainly there was no reason for it. As a surprise, Frederique swung by so that we could do the market together, both of us with baskets over our arms and leashed dogs in hand. Right away I had the good fortune of finding my very favorite roses à l'ancienne, its creamy pink an increasing rarity. The vendor even gave me an extra, gratos, with a wink no less. I found a hyacinth for one Euro with the color and scent of the gloaming. A feast of Vietnamese dumplings bought. A surprise of three poignées or fistfuls of Autumn-orange girolle mushrooms for Remi? Check. And yet. I found myself growing increasingly annoyed, impatient with the crowds, the dampness in my bones, my ever-sniffing dog until my breath felt stifled in my chest. Remi took a good look at me as I stormed into the kitchen, dramatically flinging my goods on the table. He wisely said nothing but later on, I could hear him taking out the beloved Creuset dish. Random chopping sounds. And then the perfume, the balm of something as warm as a mother's hug wafted over me. My honey had decided to take matters into his own hands and made me roasted duck with garlic, white wine, oh so many things to soothe my blues. It is so nice to have someone to just take care of you sometimes. When we don't know what to do with ourselves. Remi and I had a lovely evening talking and talking, laughing and on. Lucky girl I am. 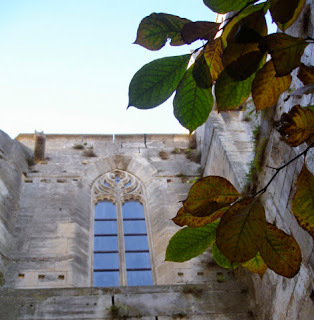 My brain seems to have been taken over by the fog that has swept the streets of Arles this morning, so I will stay quiet, commiserating over my coffee and simply offer up some of the photos from my ramblings during this glorious Autumn week. Amazingly, the weather has decided to not only get its act together but to strive towards what I would consider perfection. And so this is it, those few days of Fall that I will dream about the rest of the year. Azure sky, that soft light falling across the old stones, just a slight breeze. Ben and I went for an hour long walk yesterday morning, both of us in good spirits, wanting to be out for as long as possible. You can have all of the above for 30 Euros ($43). A splurge, admittedly, but it sounds wonderful, doesn't it? I can understand why Arlesians are so grouchy when the weather is bad because it is so addictive when it is good! Today, I was given a little gift--just enough of a reprieve in the wind to be able to sit out in the garden for my breakfast. With my turtleneck sweater on and Ben under my feet to stay warm, but still. The leaves of the mystery tree (it grows like a wild thing and so far no one has been able to tell us what species it is) are fading and falling. Tiny "red tails" are chirping wildly and hopping along the roof of the Frere Precheurs. It is quite something to have a real jardin de curé against the walls of a church, even if it is getting ready for the big winter sleep. In some ways, so am I, but not just yet. A last sip of coffee and then I am out the front door, off to rediscover Arles all over again with my funny friend. Yes, you read correctly and no, it wasn't a banquet for a king, just an everyday midweek type of thing. Remi and I actually weren't even certain that it was a lunch as the invitation was to "stop by for a glass of wine after the market." Hmm, ok, at noon? Sure enough, when we walked in the door the table was set and a bottle of Champagne was popped before we could pretend to protest. As our friends were taking care of their visiting grand-daughter there was lengthy chatting and munching of 'tomato caviar' (aka sun-dried tomato paste) covered toasts while she played with her pasta. And then for the adults, aioli, the quintessential Provençal plate of steamed legumes and mountains of stinging garlic mayonnaise (just in case you thought it was a healthy dish). The little one gave a round of bisous, or little kisses, before heading off to nap time and I could have joined her save for the melty Brie that was brought out. To at least try. One bite. And then who can say no to a home-made apple tart? Not this girl. Slight pickings at the lemon cake that I had brought and mercifully strong coffees helped to keep the conversation fuelled. I tried to properly express my disappointment at the mid-term elections, the "tea party" power over the press and that Obama is not actually a Muslim. The sun was already rosy by the time we headed out to the car, talking all the while, grateful that we didn't have an office to report to, at least not today and such wonderful friends to share an afternoon with.